Afforestation after land abandonment and the occurrence of large fires have significantly altered the composition of pine-oak ecosystems in the Mediterranean since 1950s, the latter favouring the prevalence of oak forests and shrublands to that of pine forests. Nevertheless, our ability to integrate the processes driving these changes in modelling tools and to project them under future global change scenarios is scarce. 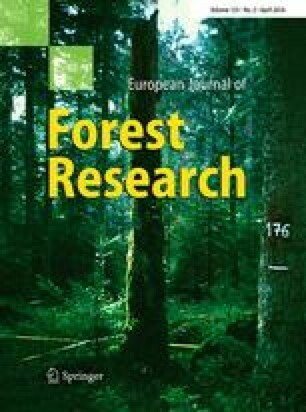 This study aims at investigating how Mediterranean forest landscape composition and seral stages may be affected by mid-term changes in fire regime and climate. Taking Catalonia (NE Spain) as study area, we predicted yearly changes in forest landscape composition using the MEDFIRE model which allows assessing the effects of different fire regimes on landscape dynamics such as post-fire regeneration and afforestation. We considered three climatic treatments based on observed and projected climate, two fire regimes largely differing in the amount of area burnt and the number of large fires, and two fire suppression strategies. While projected afforestation continued to increase forest cover in the 2050 horizon, a climate-related harsher fire regime (higher amounts of area burnt) accelerated a shift towards landscapes progressively dominated by oaks and shrublands, thus precluding general forest maturation. Fire-sensitive pine species contributed to net forest cover loss in the worst scenarios. An active fire suppression strategy partially compensated the effects of a climate-related harsher fire regime on pine forest loss and rejuvenation, whereas variability in climate projections weakly affected spatial fire allocation and afforestation. Our results highlight the need to explicitly incorporate fire suppression strategies in forest landscape composition forecasts in the Mediterranean. At mid-term, large-scale afforestation, post-fire forest rejuvenation and landscape composition changes may alter forest ecosystem functioning and potentially interact with fire suppression planning. The online version of this article (doi: 10.1007/s10342-016-0943-1) contains supplementary material, which is available to authorized users. MEDFIRE development was supported by the Spanish Government through the FORESTCAST (CGL2014-59742-C2-2-R), BIONOVEL (CGL2011-29539/BOS) and MONTES-Consolider (CSD28008-00040) projects, NEWFORESTS (EU’s 7th programme, PIRSES-GA-2013-612645) and the ERA-NET FORESTERRA project INFORMED (29183). We thank the Servei de Prevenció d’Incendis de la Generalitat de Catalunya for providing data on fire perimeters and ignitions. Miquel Ninyerola and Meritxell Batalla (UAB) generate spatially explicit climatic predictions from data provided by the Spanish Meteorological Agency and the Spanish Ministry of Marine and Rural Environment within the MONTES-Consolider project. A. Gil-Tena (Juan de la Cierva fellow, JCI-2012-12089) and M. De Cáceres (Ramón y Cajal fellow, RYC-2012-11109) are funded by Ministerio de Economía y Competitividad (Spain), Andrea Duane (PhD student grant FPU13/00108) by the Ministerio de Educación, Cultura y Deporte (Spain) and N. Aquilué (Forest Complexity Modelling fellow) by Natural Sciences and Engineering Research Council of Canada. We thank Mario Beltrán for his valuable help in age initialization.